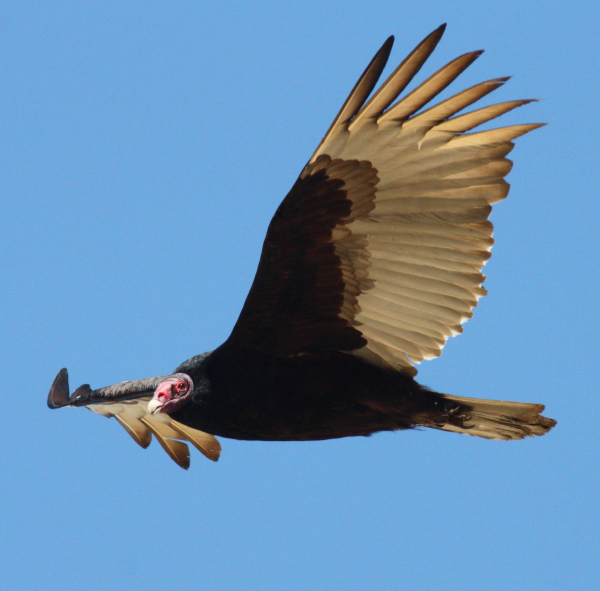 Migrating Turkey Vultures are generating excitement at American count sites. There are impressive numbers of Turkey Vultures migrating past several spring HawkCount locations, especially in northeastern Great Lakes states and Texas, with numbers like 3,529 Turkey Vultures counted at Braddock Bay, New York, and 4,143 tallied at Derby Hill Bird Observatory, New York on Monday (April 8th.) It’s equally exciting to see that Swainson’s Hawks and Broad-winged Hawks are starting to funnel north, with 458 and 429 counted respectively at Bentson Rio Grande Valley State Park in Texas, along with 1,058 Turkey Vultures and 51 Black Vultures April 6th. Count sites along the south sides of Lake Ontario and Lake Erie are tallying the most vultures migrating north, such as Ripley Hawk Watch in New York where 1,992 Turkey Vultures were counted April 7th along with 3,734 on April 2nd; and Presque Isle in Pennsylvania where 1,911 Turkey Vultures were censused April 7th, plus 2,983 on April 2nd). In Texas, Bentson Rio Grande Valley State Park tallied 4,208 Broad-winged Hawks with 348 Turkey Vultures and 139 Black Vultures April 2nd, and Santa Ana National Wildlife Refuge counted 1,741 Broad-wings, along with 447 Turkey Vultures on April 4th. Some other big numbers of migrating vultures include Mackinac Straits, Michigan; Conneaut Hawkwatch, Ohio; Hamburg Hawk Watch, New York; and Sylvan Beach, Texas. HawkCount is a project of the Hawk Migration Association of North America’s Raptor Migration Database.